Baffinland's controversial and massive Mary River iron ore mine in the Qikiqtani Region of Nunavut —almost 500 kilometres inside the Arctic circle— continues to polarize residents as the $4 billion project awaits its final approval. According to the CBC, regulators should be making a decision on what is the largest industrial project in the North of Canada before the end of the month, likely on Friday. Mary River is one of the world's richest and largest iron ore deposits containing approximately 365 million tonnes of high-grade ore that can be shipped with icebreakers directly without requiring processing that produce tailings. 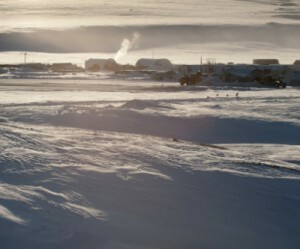 Baffinland's intentions to ship ore non-stop throughout the year have been questioned by locals, such as Jobie Tukkiapik, president of the Makivik Corporation. In July this year, he said the operation would have direct and indirect impacts on the marine life in the Hudson Strait area. Worries over damaging the region's ecosystem are also a major concern to those who rely on the strait for hunting. In March the company had to scale back work on another iron ore project after a decision by the Nunavut Impact Review Board denied Baffinland's request to leave a 10-million litre fuel barge floating in the Steensby Inlet. As it stands, the Baffinland Iron Mines Corporation is projected to move 18 million tonnes of ore for the next twenty years. The president of the NWT and Nunavut Chamber of Mines, Tom Hoefer, told CBC on Friday that one the most remarkable characteristics of the project is that royalties will go directly to the Inuit, instead of the territorial government. 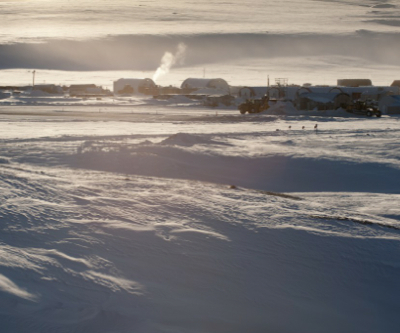 Earlier this week, the Conference Board of Canada warned that sinking global commodity prices have negatively impacted Canada’s North near-future mining outlook. Recent setbacks, particularly in the mining sector, will limit Nunavut’s expected growth for this year. From an initially projected real GDP growth of 16%, now it is expected to grow only 0.2%. “The closure of the Hope Bay mine site, lower gold production at the Meadowbank mine, and cutbacks to exploration and development budgets limited the growth outlook for Nunavut,” says the report. However, the economic think-tank remarked the construction of the Mary River and Meliadine mines will cause real GDP to surge by 17% in 2013 and 14.2% in 2014. Image: Mary River project location. Courtesy of Baffinland Iron Mine.